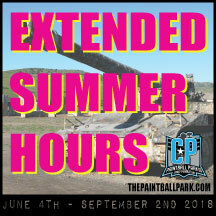 The Paintball Park at Camp Pendleton is gearing up for SUMMER 2018! We will be extending our walk-on hours from June 4th to September 2nd – open from 8:30 to 5:00 seven days a week! You can still call to book a private group or night game at our office number, 866-985-4932 anytime. Also, be sure to keep an eye out for special discounts and offers throughout the summer months. We’ve got exciting things planned for you. Visit our Facebook, Instagram and Twitter pages for more updated info. and events by just searching The Paintball Park at Camp Pendleton.